In coilgun design, all decisions are based on the projectile’s characteristics. This must be chosen first; all subsequent choices are made from this. Headless: allows smaller-diameter firing tube. Low mass: permits higher velocity from F=ma (or a = F/m). Pre-formed: saves fabrication time and effort. 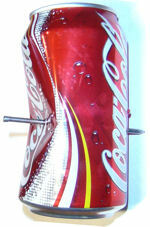 Inexpensive: allows disposable, low-cost projectiles. Note that this is at the expense of velocity. That is, a special projectile made of high-permeability laminated iron may have better speed due to increased magnetization and reduced eddy currents. Nails and “finishing nails” are nearly an ideal choice for hobbyists and their magnetic characteristics will work fine. However, information is not available on their magnetization curve or their magnetic saturation limits. The lack of data will make it difficult to create an accurate computer model but we can do a great deal of testing without any modeling. The image below shows the nails chosen for this coilgun, labelled in order of increasing mass. 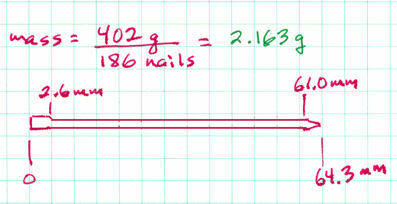 The average mass of projectiles in grams was measured on a kitchen scale by weighing the approximately one-pound boxes and dividing by the number of nails. The figure below shows the exact dimensions of a typical nail. Although we have not done so, this will be helpful in creating a FEM (finite element magnetics) model.